The Easter weekend is on the horizon, meaning family get together’s, yummy food and the odd G&T! If you are hosting this long weekend, then you are in the right place! We have compiled our top Craft Gin Club ginny bakes for you to blow your guest’s minds with this Easter! Not only are they super easy but they are also drenched with gin and the perfect end to an EGG-xtravagant Easter feast! Preheat oven to 180C, 350F or Gas Mark 4. Cream butter and caster sugar together until light, fluffy and pale. Crack in the eggs, and beat until combined. Fold in the flour, then add grated zest of both lemons. Add the juice of 1 lemon and 4 shots of gin, then pour into a lined 1kg loaf tin. Bake in the centre of the oven for 45 minutes, or until a knife inserted into the centre of the cake comes out clean. Remove from the oven, and set aside while you make the drizzle. Mix the remaining gin, sugar, tonic water and juice of 1 lemon in a bowl. Leave the cake in the tin and, whilst it’s still warm, prick the surface of the cake all over with a skewer, then poor over the drizzle. Leave the cake to cool in the tin. It will look a bit messy, but as the drizzle soaks in and the cake cools, the sugar will crystallise to leave a crunchy topping. Preheat the oven to 180c and grease a 20cm cake pan. Beat the butter and sugar until pale and fluffy, then slowly beat in the eggs one by one until the mixture is smooth. Gently mix in the rose water, vanilla and lemon zest. In a separate bowl, sift together the flour, ground almond, cardamom, nutmeg, salt and baking powder. Slowly incorporate the dry mixture and the milk into the batter, alternating between the two. Transfer to your greased cake pan and cook for 40-50 minutes, until the top is a golden brown and a skewer comes out clean. To make the drizzle, gently heat 50ml of the gin, the rose water and sugar in a saucepan until the sugar has dissolved. Remove from the heat and stir in the remaining gin. Score the cake with a skewer and pour the drizzle over the warm cake. Leave to cool, then transfer to a wire rack. Mix together the lemon juice and icing sugar, then slowly add as much milk as needed to form a thick glaze. Pour across the top of the cooled cake. 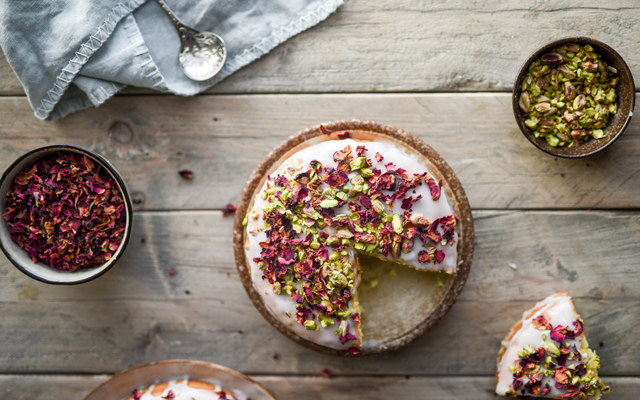 Decorate with dried rose petals and chopped pistachios. Pulse the biscuits and sugar in a food processor or crush in a ziplock bag with a rolling pin until you have fine crumbs. Melt the butter and combine with the biscuit. Flip the base of an 8-inch springform tin so the ridges curve downwards, then press the mixture firmly into the base. Bake for 10 minutes. Beat together the cream cheese, mascarpone and honey. If you’re colouring the cheesecake then (carefully!) tint the mixture until your desired colour is reached. Add the remaining vanilla, lavender and lemon juice. In a separate bowl, add a touch of gel colour to the double cream, then whip until thick. Fold this into your cheesecake mixture and spoon or pipe the mixture onto your biscuit base. Chill in the fridge for at least 6 hours. Serve drizzled with honey and a scattering of lavender, or crumble honeycomb on top for a decadent touch. To start, add the fresh strawberries, gin and rosemary to a bowl and leave to steep in the fridge whilst you make the meringue. Preheat the oven to 160C/140C fan and line a baking tray with baking parchment. To make the meringue, add the egg whites to a free-stand mixer and whisk until they form stiff peaks. Gradually add the sugar, making sure it is well combined after each addition, and whisk until the meringue looks glossy. Whisk in the corn flour, vanilla and vinegar. Pour the meringue mixture out onto the prepared baking tray and using a spatula, spread out the mixture into an even layer. Turn down the oven to 140C/120C fan and bake the meringue for an hour. 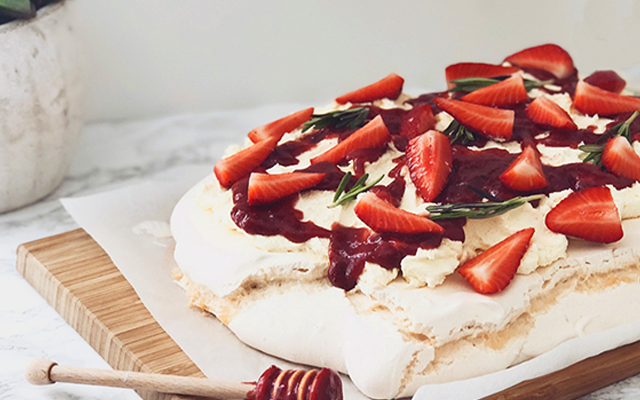 Once the pavlova has baked, turn off the oven and let the meringue cool completely in the oven. Whilst the meringue cools, make the strawberry and rosemary coulis by adding the steeped strawberries and gin to a saucepan. Add the sugar and set over a medium-low heat. Stir until the strawberries begin to break up and the sugar has fully dissolved. Remove from the heat and place the mixture into a food processor and blitz until smooth. Push the strawberry mixture through a sieve and then set aside to cool. Once the meringue has cooled, melt the white chocolate in a bowl set over a pan of boiling water or in the microwave. Once the chocolate has melted, paint the top of the meringue and leave the chocolate to cool. 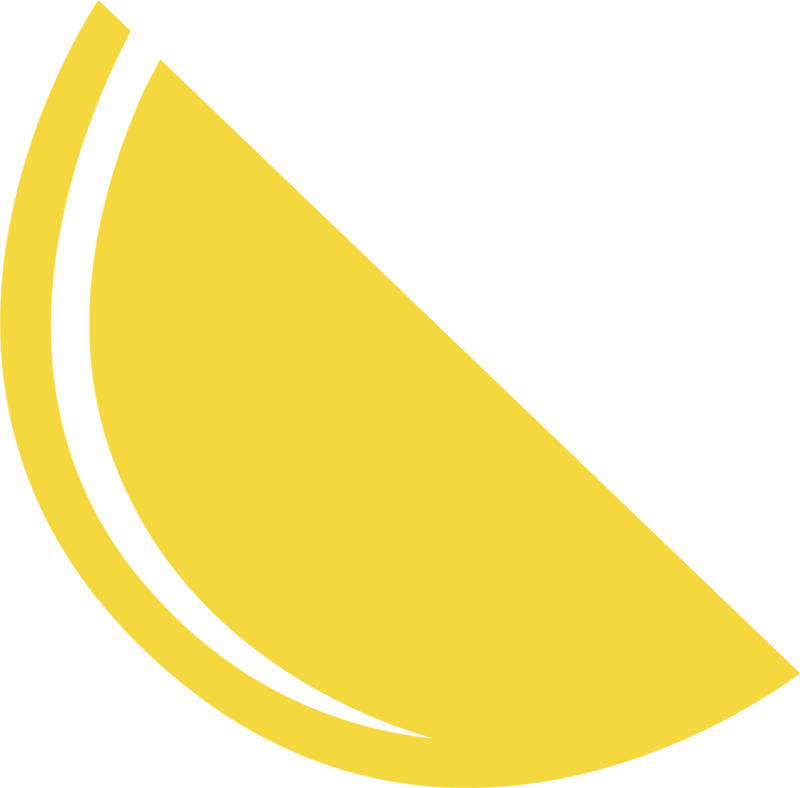 To make the pastry, place the butter and lemon zest in a food mixer and blitz until soft. Sieve in the icing sugar and mix until light and creamy. Mix in the egg yolks with 2 tbsp water, then add in the flour until the mixture begins to clump. On a lightly floured surface, bring the pastry together into a ball, then wrap in cling film and flatten lightly to form a disc. Chill in the fridge for 30 minutes. Whilst the pastry chills, make the lemon curd by adding the lemon zest and juice, the sugar and the butter into a heatproof bowl. Stir the owl over a pan of lightly simmer water until all of the butter has melted. Lightly whisk the eggs and egg yolk and stir them into the lemon mixture. Whisk until all the ingredients are well combined, then add the Lighthouse Gin. Leave the mixture to cook for 12-15 minutes until the mixture is creamy and thick enough to coat the back of a spoon. Once the pastry has chilled, roll out the pastry to the thickness of a £1 coin and use to line four 10x2cm loose-bottom tart tins trimming off any excess. If the pastry breaks of cracks, patch up with any trimmings. Put back in the fridge whilst you make the filling. To make the tart filling, beat together the lemon zest, butter and caster sugar until light and creamy. Add the eggs one at a time, including a spoonful of the ground almonds with each addition. When all the egg has been added, mix in the remaining ground almonds and flour. Remove the pastry from the oven and spread a generous amount of the lemon curd over the bases of the tart cases. Spoon or pipe over the filling and smooth with a palette knife or spatula. 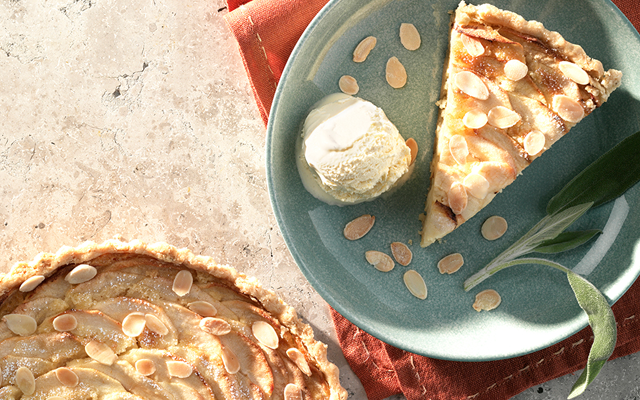 Scatter over the flaked almonds and place tarts on a baking tray. Place in the centre of the preheated oven for 15-20 minutes until lightly golden. Remove the tarts from the tin and allow to cool. 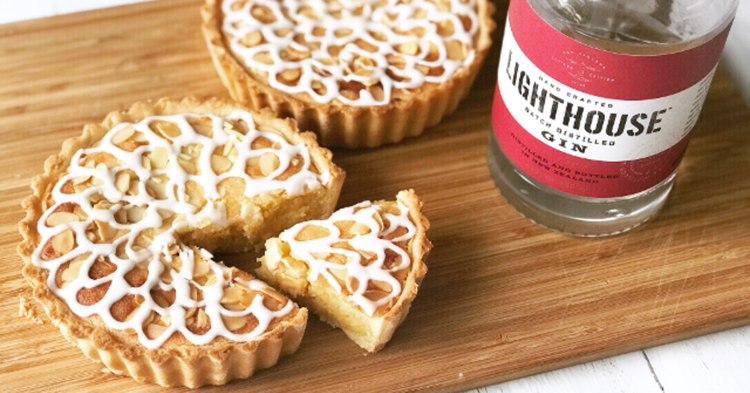 Decorate with either a dusting of icing sugar or mix the icing sugar with Lighthouse Gin to make a nice drizzly icing.